In my earlier post, I shared details of how I make the child safe wood finish made from purified beeswax and mineral oil that I use on my wooden creations meant for little ones. In the past year I’ve had several emails asking for a more specific ratio of wax to oil. As I needed to make more of this kid safe finish for my wooden toys available in my etsy shop, I used a scale and took notes while cooking up a batch. Making it about 6% beeswax. I hope this helps answer your questions if you want to make larger batches or be more precise in mixing up this nontoxic finish that works great on wooden toys you may be crafting. *** Using hot oil and wax over an open flame can be dangerous. If you have a gas stove, you should use extreme caution or a double boiler. It’s not really any different then deep frying with oil or crisco on your stove top but I had a friend who suggested I put a warning up here about using oil on a stovetop and I think he is correct. 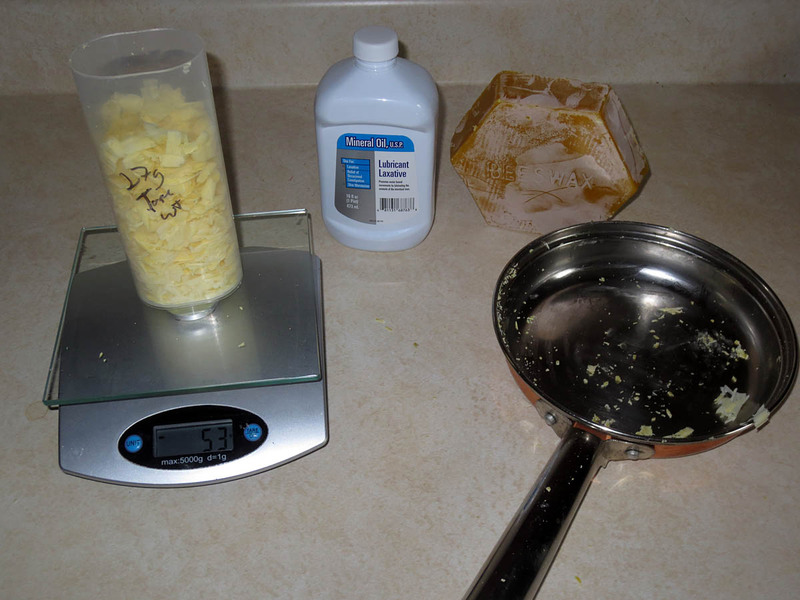 An alternative method is to use a double boiler with a jar as your container for the wax and oil. As with all things, use your head, be smart when doing projects at home, and above all BE SAFE!